Both parents and educators wish to inspire children toward a healthy lifestyle. Introducing yoga at an early age not only builds strength and flexibility but can also bring a level of calm into their lives. As a registered children’s yoga teacher, I strive to prepare imaginative, fun and thematic-based classes for participants. But I hope to encourage parents and caregivers to create their own home routines as well. One way to begin is with a basic Surya Namaskar (Sun Salutation). The Sun Salutation is a traditional yogic warm-up of linked asanas. The Sanskrit term, Surya Namaskara, translates as “salute to the sun.” For young children this interpretation might become “hello sun,” a “sun dance” or a “sun thank you.” Since there are many styles of yoga, with different poses included for each of their Sun Salutations, feel free to select the one that is most appropriate for you and your child. Celebrate every attempt at poses by your child. Some days a “Hello to the Sun” may consist of only a Tadasana (Mountain Pose), Urdva Hastasana (Upward Hands or Tall Mountain Pose) and forward folding poses. Whatever comes, give lots of praise and do the poses with them! Below are the basic poses found in one common variation of a Sun Salutation. I have included notes with elements my class participants enjoy, as perhaps your child will too! Mountain Pose: Stand tall like a mountain with your arms at your sides. Note: Count with your child how many seconds they can stand like a statue before it is time to go on to #2. 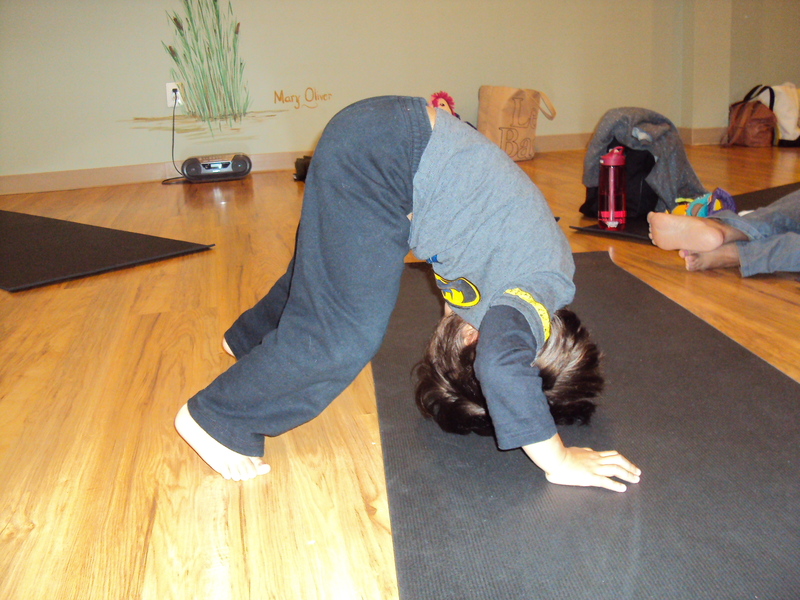 Uttanasana (Standing Forward Bend Pose): Encourage your child to fold over to tickle their toes or tickle your toes! Note: Hinge forward at the hips. It’s okay if you need to bend your knees. Anjaneyasana (Lunge Pose): Step one leg back—traditionally it is the right leg—keeping your front knee bent at 90 degrees. Your back knee can be lifted or left to rest on the ground. Note: Children often need to watch their parent with this pose. To encourage them to take a big step back, use a piece of tape or some visual aid as a marker for that foot to reach to. Adho Mukha Svanasana (Downward Facing Dog Pose): Step your front leg back from the lunge to form an inverted “V” position. Note: Children love to be in Downward Facing Dog Pose under your “dog house” (your Downward Facing Dog Pose) or have a plush animal under their “dog house.” Everyone can bark together! Bharmanasana (Tabletop Pose) to transition to belly: Bend both knees to become a table (quadruped/all-fours position) and then slowly lower onto your belly. Note: You might ask your child what they can see, smell or hear when they are on their belly and that close to the earth. Bhujangasana (Cobra Pose): Place your hands under your shoulders with your elbows tucked in and lift the upper body. Note: Children love to hiss or move their tongue in and out like a snake in this pose. Downward Facing Dog Pose: From Cobra Pose, return to Tabletop Pose and then pike your hips back up into the inverted “V” of Downward Facing Dog Pose. Note: Show your child how they can “wag their tail” by moving their bottom side to side or “walk the dog” by bending one knee and then the other. Lunge Pose (other side): Step your right leg forward and bend that knee. Note: Use the marker from #4 to show where to bring the leg forward from Downward Facing Dog Pose. While in the lunge your back leg can be lifted and lowered like a wind-up toy. Standing Forward Fold: From the Lunge Pose, step your back leg forward so both feet are now together. Note: Once again, tickle the toes or have a favorite toy do the tickling. Tall Mountain Pose: Reach your arms back up to the sky. Note: Children never seem to tire of “high-5s” to the sun, especially when you challenge them by holding it higher and higher. Mountain Pose: Return your arms to your sides or to Anjali Mudra, (prayer hands) at your heart center. Standing opposite your child in Anjali Mudra, take a moment to remind them that their special inner sun or light is behind their hands at their heart center and that your light shines to their light and their light shines to your light. Remind them that they are amazing, unique, kind and loved. Susan Kain, e-RYT, RCYT, has taught yoga for seventeen years. She is a former educator with over thirty years’ experience in working with children. In preparation for toddler and preschool classes, Susan has created various picture books. The first to be published is entitled, I Can Be One Too! 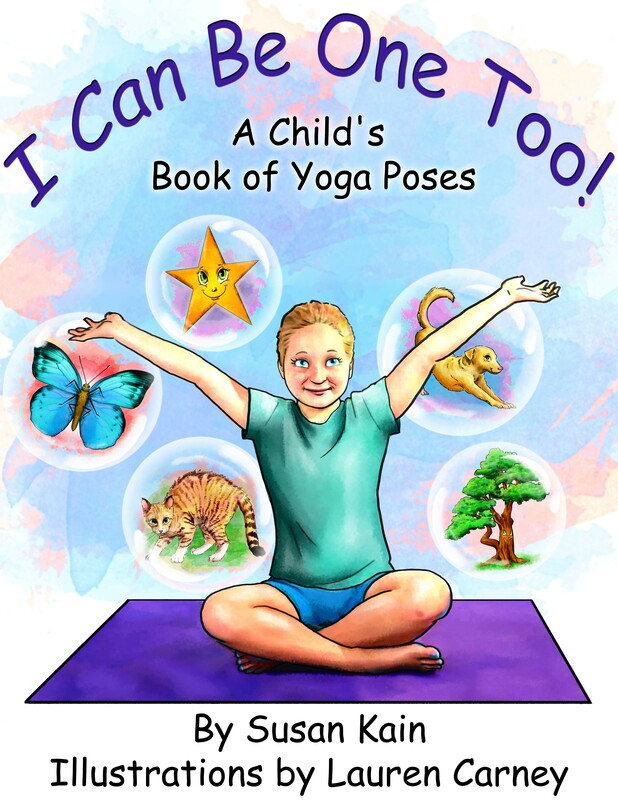 A Child’s Book of Yoga Poses. 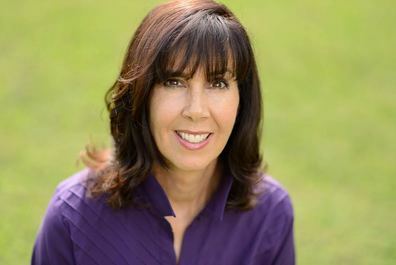 You can reach Susan through her website at www.susankain.com. 1. Bodrova, Elena, and Deborah J. Leong. 2011. “Revisiting Vygotskian Perspectives on Vygotskian and Post-Vygotskian Views on Children’s Play and Pedagogy.” In Rethinking Play and Pedagogy in Early Childhood Education: Concepts, Contexts and Cultures, edited by Sue Rogers, 60–73. 2. Saraswati, Satyananda. 1990. ‘Yoga Education for Children.” pages 25-28, page 30.